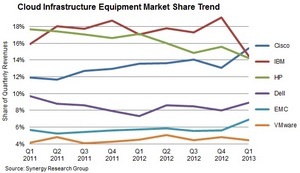 RENO, NV--(Marketwired - Jun 10, 2013) - New Q1 data from Synergy Research Group shows that Cisco has taken over leadership of the cloud infrastructure equipment market, just one quarter after IBM's share of the market had hit a two-year high. The first quarter was an exceedingly poor one for the server market, and as a consequence IBM and HP both took a big hit in cloud infrastructure equipment revenues. Meanwhile Cisco had a very strong quarter in public cloud networking infrastructure, helping it to grab more than 15% share of the overall cloud infrastructure equipment market. Total revenues for the quarter were $9.7 billion, 12% down sequentially but marginally up on the first quarter of 2012. On a rolling four quarterly basis, annual growth has dropped off a little to 3%. Computing system's share of total cloud infrastructure equipment revenues dropped off to 46% in the quarter, while both networking and storage accounted for about a quarter of total revenues. "Cisco has been steadily and consistently building its share in this market and now finds itself in the leadership position," said Jeremy Duke, Synergy Research Group's founder and Chief Analyst. "While the server market is somewhat volatile and subject to substantial quarterly swings, we're also seeing the effects of two disruptive trends taking hold which are impacting the big server vendors in particular. Firstly, companies with massive data centers like Google and Rackspace are increasingly building their own server platforms assisted by ODMs. Secondly, due to the market adoption of Infrastructure as a Service (IaaS), organizations both big and small are increasingly outsourcing their data centers. We believe this will continue to fuel M&A activity, as we have just seen with IBM's acquisition of SoftLayer." Synergy provides quarterly market sizing and segmentation data, including vendor revenues by segment and by region. Data is provided via Synergy's uniquely flexible SIA database which enables rapid analysis and provides a range of graphic data presentation options. Synergy Research Group (www.srgresearch.com), a strategic partner of TeleGeography (www.telegeography.com), provides syndicated market research and custom consulting for strategic decision makers in the IT and Telecom industries. For over a decade, Synergy has been providing unique insights and analytics to marketing, business development, and investment professionals. To speak to an analyst or for more information on receiving a copy of this report, please contact Heather Gallo @ hgallo@srgresearch.com or at 775-852-3330 extension 101.